Agent bias can be overcome by including FCR in quality monitoring reviews. 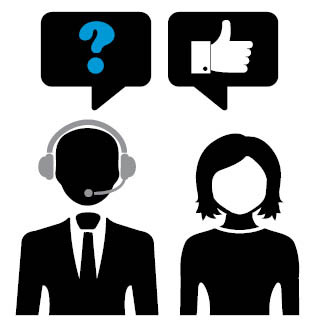 When listening to call recordings or doing side-by-side monitoring, QM analysts or supervisors look for the right confirmation from agents and customers at the close of the contacts. They apply pre- specified scoring to that element of the call to facilitate individual, team, group and center reporting. As before, this approach may not capture customer activity prior to the current contact, and clearly lacks visibility into follow-up contacts. It also relies on a large enough sample size to make reasonable inferences about overall performance. Speech analytics may be able to automate this process and generate a sufficiently large sample size. Consistent with a preference for the customer perspective, surveys may be useful for tracking FCR. An IVR application, follow-up email with a link to an online survey, or performance management application could ask customers if their issues were resolved or if it took more than one agent interaction for completion. Surveys can be issued immediately for transactions with clear outcomes-e.g., order placed, status provided, transaction completed. Some delay can be inserted if the mix includes more complex interactions or a clear trigger for follow up. These delayed options are generally vis email or a call, and are often conducted by a third party. Of course, delays pose the risk that customers will either forget the details of their interactions or be disinclined to participate. Any survey may fall prey to a self-selection bias, perhaps attracting the cranky customers and losing the satisfied ones who are too busy to offer feedback. Bottom line: There are a variety of contact center tools that can play a role in measuring FCR. You need to determine the best fit for your center based on your customers, contact types, available technologies, budget and resources (IT, contact center support, management). Given the pros and cons of each option, the solution might be a multipronged approach that spans internal and external views while providing checks and balances on the captured data. Now that we’ve talked a bit about measuring FCR, let’s look at tools that may help you achieve (or improve) FCR. As usual, these tools go hand- inhand with good processes and the right contact center support and IT resources to use them effectively, across all channels. It starts with getting contacts to the right resources through well-defined, easy-to-understand prompts and contact routing. If contact complexity or diversity argues for skills-based routing, make sure you define agent skills with an eye toward FCR. If you over-segment, customers will get so confused that they’ll go to the wrong pool or simply bail out of the prompts in favor of the general group. While the universal agent approach sidesteps this issue, the center must provide training and tools (e.g., KM, desktop) to help agents succeed. Context- based routing bridges the gap between these approaches by leveraging data about the contact, the customer, the situation in the center, etc., to customize prompting and route customers to the right resources. Artificial intelligence (AI) is paving the way toward higher self-service success rates. AI “bots” provide a smart and conversational user interface along with an app that provides answers, guides users through transactions, knows when to get a human involved, and finds the right one. While some may be single-channel (e.g., a chatbot), a preferred long-term approach is to have an omnichannel platform that can serve customers via a variety of channels—voice, web chat, text chat, etc. Beyond its role in measuring FCR, QM can be used to unearth the root causes of FCR failures, especially when screen recordings accompany the voice recordings. And, of course reports, scorecards or dashboards, gamification, and other performance tools play a role in helping to assess how people are doing, identify coaching opportunities, and motivate people to achieve the defined goals. If you don’t have a clear picture of your first-contact resolution rate, or you aren’t reaching your goals, it’s time to get serious about how you’ll measure and achieve FCR. A strategic planning effort with a crossfunctional team can launch you on the path to success. Include frontline leadership as well as support resources like quality monitoring, trainers and analysts. Take advantage of your IT experts to see how you might adjust use of existing tools or find new ones. Above all, put the customer experience first and consider the pros and cons of various approaches as you determine the best fit for your environment.